I’ve always known I was SUPPOSED to be using sunscreen to avoid skin cancer and premature aging, but for many, many years, I avoided it like the plague because I thought it made me break out. Luckily, I’m not an outdoorsy person, so I wasn’t getting a lot of sun in the first place. And yeah, I live in sunny California, and I know that seems odd, but it’s the truth! When I went to the beach or the park or something, I’d always put it on. But not every day. UNTIL I got melasma. I got big brown splotches on my cheeks after taking a medication that increased my hormones. I wasn’t even spending much time outside, but the hormones made me ultra sensitive to the sun. I’ve had them now for over a year, and they aren’t budging. I’m looking into laser treatments, but that’s not the point of this article. The point is that now I’m a cruelty free sunscreen convert. I am still concerned with breakouts and my skin is combination/oily, so I avoid anything greasy. I wear sunscreen daily now – even when I’m just inside working (you still get UV rays from the windows)! I thought it would be helpful to go over my favorite cruelty free sunscreen for your face. There are lots of great options for cruelty free sunblock or SPF, but let’s talk about the ones that won’t make you break out or have a shiny face full of oil. None of these are heavy or have a sunscreen smell. There’s a mix of physical and chemical sunscreens here, several application types (primers, tinted moisturizers, lotions and setting sprays), as well as options for oily, normal and dry skin types. There is a lot of discussion over which types of sunscreens are best. 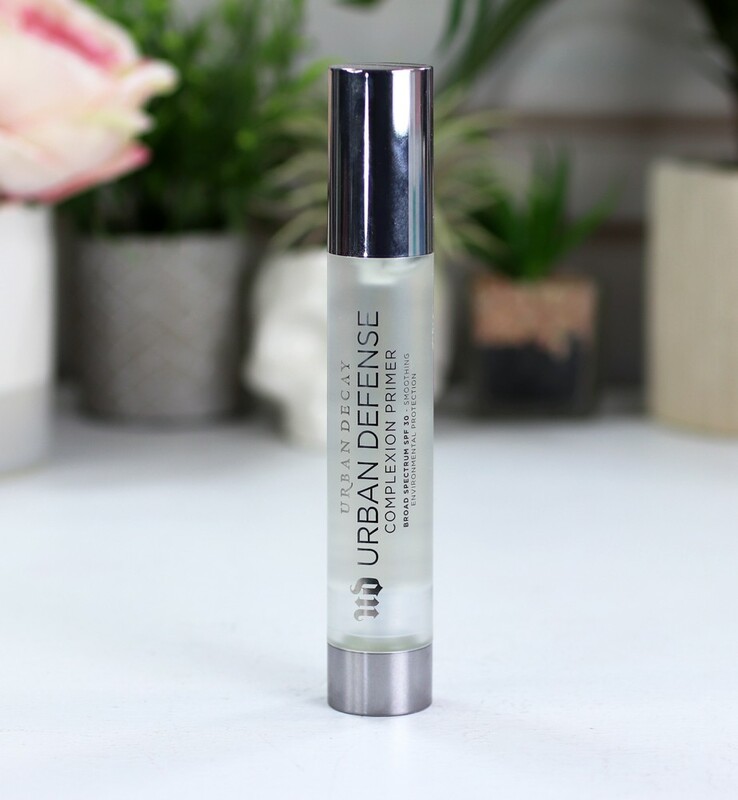 Broad spectrum is important and basically means it defends against UVA and UVB rays. There is now talk of the need to block IR (infrared rays). I’m quite frankly a little confused about that, because I had always heard infrared rays were good for your skin. 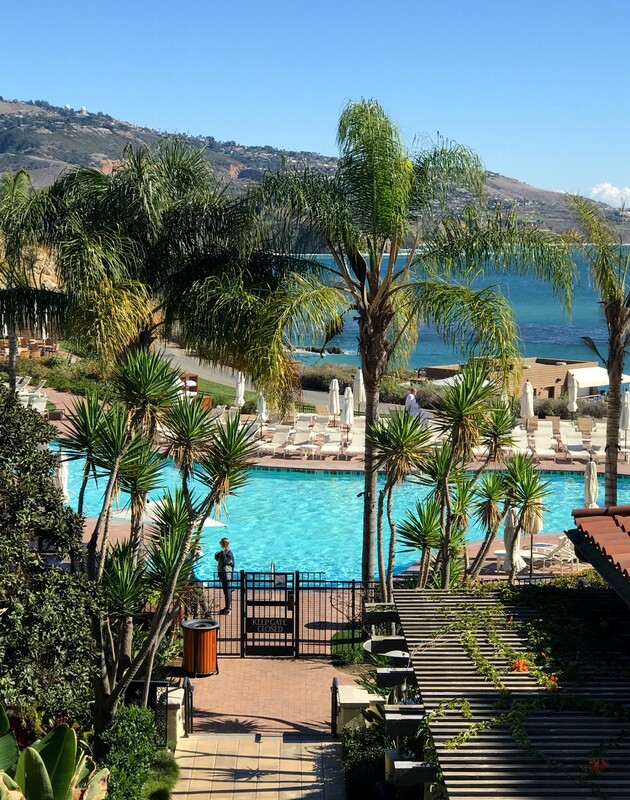 The jury is out on whether the products with IR protection are any different from regular sunscreens (it seems like most just have added antioxidants, which can’t hurt). I’m still learning about IR sunscreens, so I’ll post another article when I learn more. There’s always a raging debate over physical vs chemical sunscreens. I’m just learning that chemical sunscreens create heat, which can be bad for rosacea and melasma. There’s a really good article by Renee Rouleau on the pros and cons of physical vs chemical sunscreens here. How often should you apply cruelty free sunscreen? For everyday sun protection, you should apply every two hours. Water resistant sunscreen can be helpful, but you still need to apply every 30-40 minutes if you’re in the water, sweating, or toweling off. The powdered and spray-on sunscreens make re-applying super easy – especially if you’re wearing makeup. 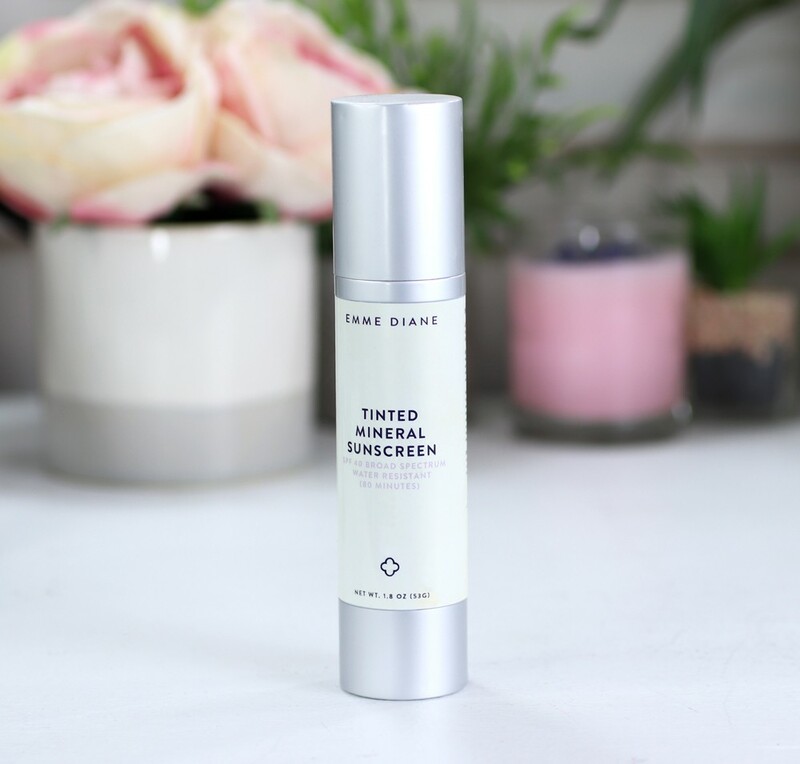 The Emme Diane Tinted Mineral sunscreen is my all-time favorite, ride or die, daily sunscreen. I have been using Emme’s products since November of last year, and I put the cruelty free sunscreen on as the last step in my skincare routine each morning. On most weekdays, I don’t leave the house. I work from home, so I’m just hanging out in my blogger uniform (sweats and no makeup!). I love that the Emme Diane mineral sunscreen gives me some coverage, blurs out fine lines and acne scars, and is not greasy! But most importantly, I know that Emme uses only non-pore-clogging ingredients in her products. So I feel 100% confident wearing it daily. It’s made with zinc oxide (3.8%), titanium dioxide (8%) and dimethicones (don’t worry – the dimethicone molecules are too big to clog pores). And of course, like all products reviewed on the My Beauty Bunny blog, it’s not tested on animals! Emme also has an Illuminating Tinted Sunscreen SPF 58 that a lot of my beauty blogger friends are obsessed with. If you prefer a glowy look, or if you have dry skin, you’ll love the Illuminating Tinted Sunscreen. I have worn makeup on top of the Emme Diane sunscreens, but I find that it’s better on its own. All Emme Diane sunscreens are made with physical (mineral) sun blockers, so they are naturally “broad spectrum”. Broad spectrum means it protects against UVA and UVB rays. Use my code Bunny10 to save on your Emme Diane skincare order! 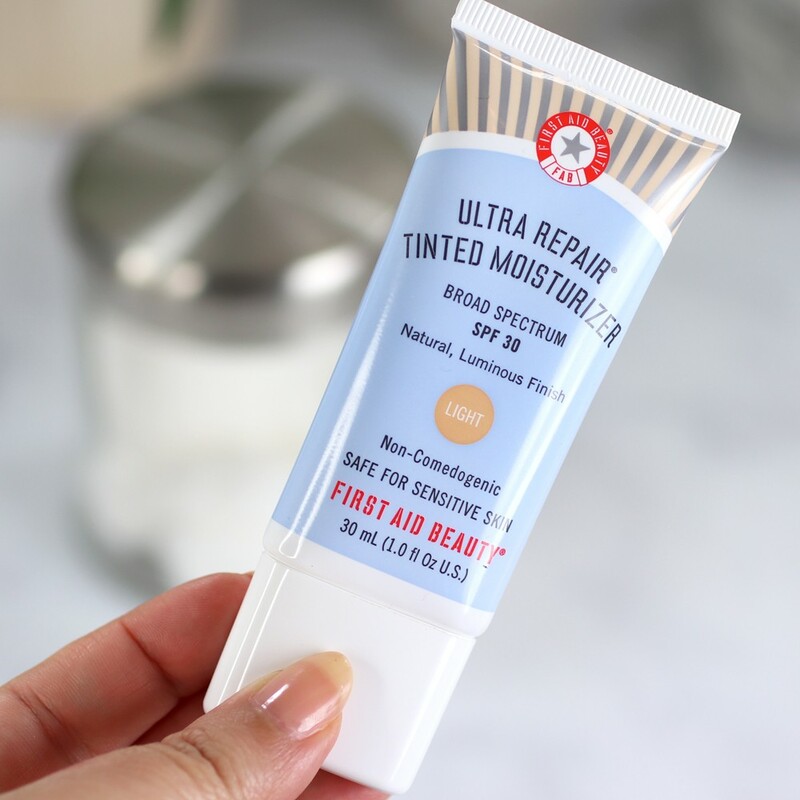 If your skin is normal to dry, and you want a simple, skin-healing formula (or if you just want a dewy look), the new First Aid Beauty Ultra Repair Tinted Moisturizer is going to be your new best friend. It’s got SPF 30 and a medium level of coverage. 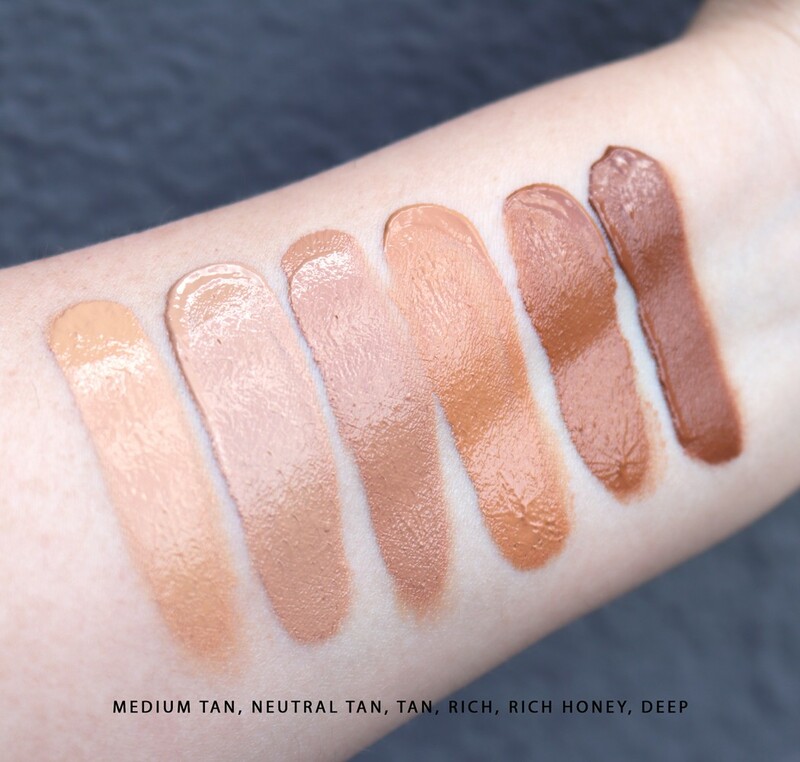 It comes in five shades (fair, light, medium, tan, and rich), and I’m hoping they’ll come out with more shades (light and dark) if these do well. The fair shade is a little too peachy for me, and the light shade works, but it’s a shade too dark. I can totally make it work, but I have to be careful to not miss any spots, and to blend well into my neck (which I would be doing anyway with SPF). And remember, with these kinds of products, you don’t want to apply a sheer coat, or you won’t get the full benefit of the cruelty free sunscreen. I usually apply it and then go back over the areas that have melasma or are more prominent on my face (nose, cheeks, chin). The ingredients are safe for dry, red or sensitive skin, and it has some of the same healing ingredients as the original Ultra Repair Face Moisturizer: colloidal oatmeal, hyaluronic acid, and Vit E. But the formula is lighter than the moisturizer, and safer for oily and acne-prone types. It has avobenzone (3%), octinoxate (7.5%), octisalate (5%), octocrylene (7.5%), licorice root, white tea, feverfew and mica for a dewy, glowy effect. 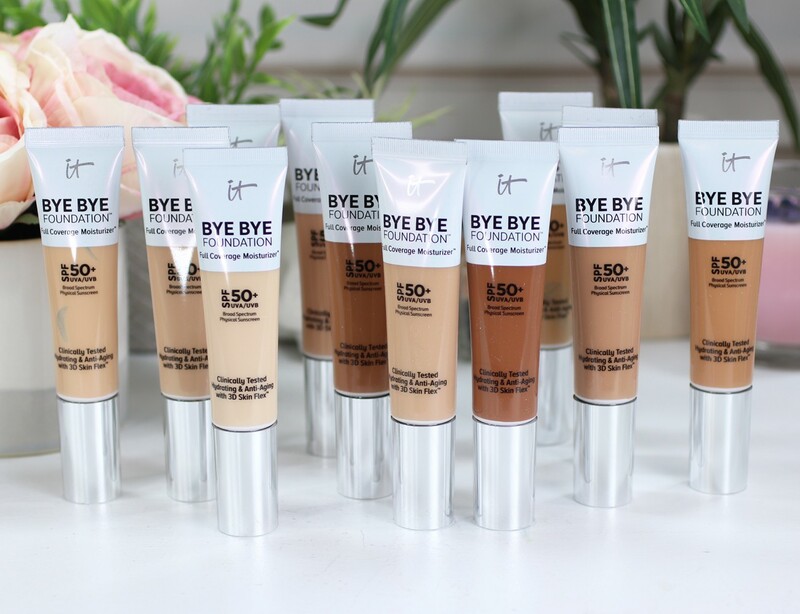 The It Cosmetics Bye Bye Foundation Full Coverage Moisturizer is a good one for normal to dry skin. It has SPF 50+ with mineral/physical sunscreens (titanium dioxide 9.0% and zinc oxide 6.3%). It’s being sold as a moisturizer (not a foundation), but I think it’s pretty similar to their CC Cream – only more hydrating. Semantics and marketing really – you can call it whatever you want! BUT, this is so much more than a foundation in the sense that it has a lot of skin-healing and anti-aging ingredients (including a lot of fermented ingredients). I tried the Fair shade (I normally wear “Light” in the CC Cream but Fair seems like a better match for me in this range) and it looked really nice and glowy while making my pores look smaller! It gave me surprisingly REALLY nice full coverage. After five hours, I really didn’t have much oil breaking through, which surprised me since I thought this would be a product specifically for those with dry skin! Since this is a brand new product, I’m not sure if it will cause breakouts. I haven’t tested it long enough to know, but what troubles me is the SUPER LONG list of ingredients. They may all be fine for acne-prone skin, but there are just too many ingredients and it’s a little past my pay grade if you get my drift. I do know kelp is supposed to be a trigger for acne, but is the fermented kelp in this formula in the right amount to cause trouble? I don’t know. I do know that there are a ton of GOOD ingredients – especially for hydration and anti-aging. I think I’d need a dermatology degree to really pick it apart, so all I can say is – try it – and if you see your skin improve, keep using it! IF you break out, move on. Acne is temporary after all! If you’re dealing with normal, dry or mature skin, I think you’ll be very pleased with the results – not just while wearing it, but over time as your skin health improves. I should also note that the range has Rich, Honey and Deep shades, but was under fire for not being inclusive of darker skin tones. I think the days of having a huge range of pale to medium shades and a couple of darker shades is over. Since the launch of Fenty Beauty, consumers are finally raising their voices loud enough to be HEARD, and it’s working. I will also say that It Cosmetics says they are working on darker shades, and that the physical SPF in this product is the main reason they haven’t been able to go as dark as they’d like. I’m not a chemist, so I can’t comment on that. 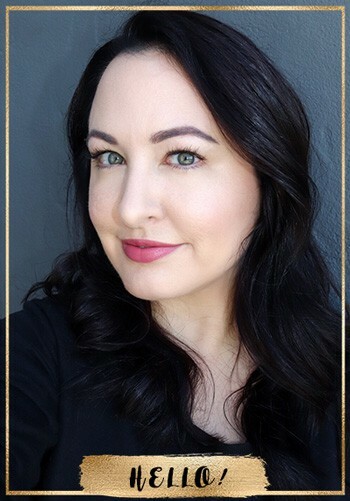 I went to an It Cosmetics event recently where Jamie Kern Lima (the founder) and her team swore up and down that they before all this went down, they were already in the process of creating a 40+ shade range collection (that will be available next year). 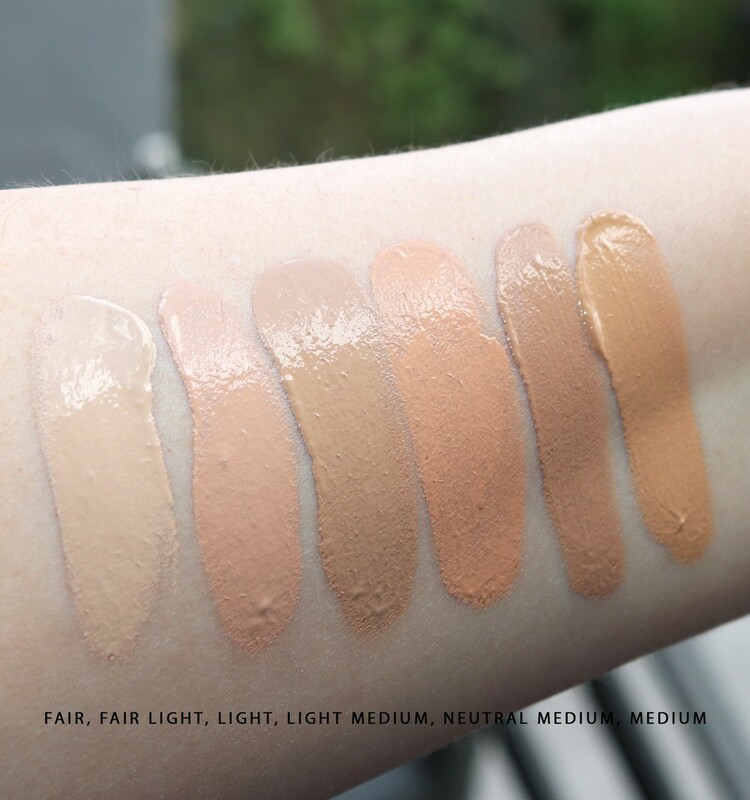 The lack of darker shades is a huge problem that has been going on for ages in the beauty industry (so many brands don’t even go past a medium shade! ), but It Cosmetics is now owned by L’Oreal so they should have money and access to labs to create more inclusive shade ranges. Overall, I think it’s great that brands are starting to listen, and I think we’ll get there. This product is not tested on animals, but it is owned by a non-cruelty-free parent company (L’Oreal), and it has animal ingredients: snail secretion filtrate, hydrolyzed collagen, silk extract, etc. This one is NOT vegan. 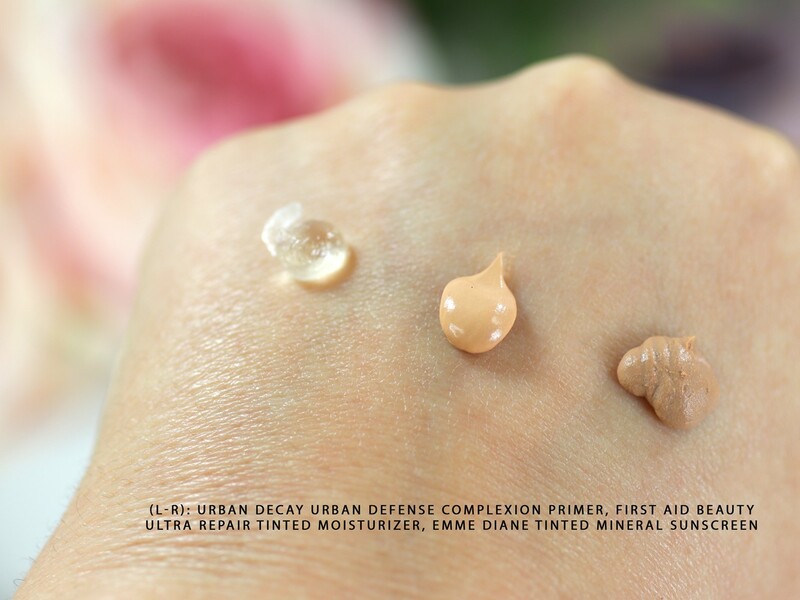 The Urban Decay Urban Defense Complexion Primer is a broad spectrum cruelty free sunscreen and primer in one. It pairs nicely with makeup and it protects against UVA and UVB rays. It has some interesting skin conditioning ingredients like sesame seed extract, tomato fruit extract, squalene, and bisabolol. This product has that slippery, dimethicone primer feel – honestly it does feel greasy (but not sticky or tacky) going on. If you’ve tried other primers, you know what I’m talking about. BUT, it doesn’t feel oily or greasy once you put makeup on top of it. It gives you a smooth canvas, protects your skin with SPF 30, and gives your makeup something to stick to. To give you an idea of the texture, there’s a close-up photo of the product at the top of this post. It has not made me break out, so I feel comfortable recommending it to those with acne-prone skin. BUT, keep in mind – physical (mineral) sunscreens are known to be less pore-clogging and irritating than chemical sunscreens. This primer is made with avobenzone (3%), homosalate (10%), octisalate (5%) and octocrylene (4.6%) – all chemical sunscreens. If you prefer physical sunscreens, another great cruelty sunscreen primer option is Coola Daydream Mineral Primer SPF 30 (Titanium Dioxide 2.3% and Zinc Oxide 4%). These powder sunscreens are quickly becoming favorites because I can use them to set my makeup AND I can easily bring them with me to re-apply (since you’re supposed to re-apply sunscreen every two hours!). 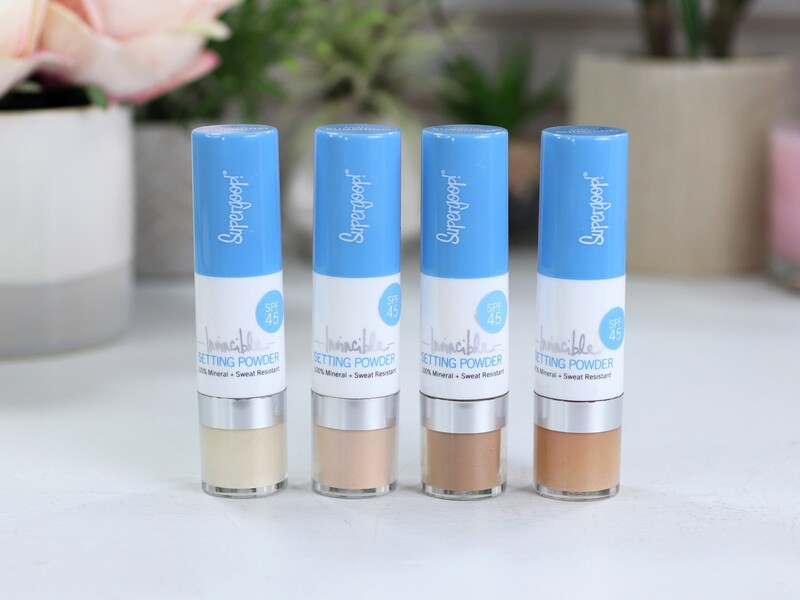 I’m loving Supergoop Invincible Setting Powder SPF 45, which also comes in four shades, including translucent (which is great for all skin tones!). Supergoop’s setting powder has a broad spectrum physical sunscreen (Zinc Oxide 24.5%). It also has ceramides and olive glycerides to seal in moisture, and coated silica to diffuse the light and make your pores look smaller and less noticeable. You can also buy refills and the brush comes off so you can wash it! I love this powder, and it gives me a nice matte finish, but because it’s a good sunscreen, it’s not as fine as my regular setting powders. That means it’s easy to get a little too powdered. And it’s also hard to see where you’re applying it, and easy to miss spots. For that reason, I like to use this in addition to other sunscreens, and as a touch-up throughout the day. I can apply over makeup, and I can also use it on my body as needed. Lately my tactic is to layer up my sunscreens, so I may start out with a primer or tinted moisturizer and then layer that with an SPF setting powder and/or a setting spray with SPF. You can’t just add up all the SPF numbers to get one huge super number, but adding different layers of sunscreen means you are less likely to miss any spots, and you will get more coverage than using just one. When I first learned about setting sprays with SPF, I was over the moon! For one thing, it’s nice to have an option when you forget to apply your cruelty free sunscreen BEFORE you do your makeup. And it’s also great as a touch up throughout the day. 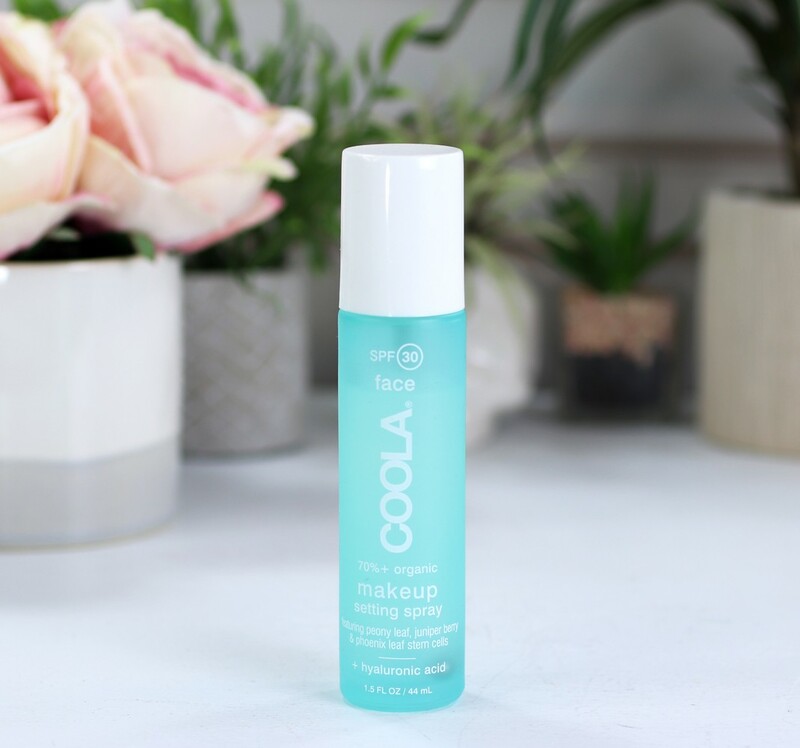 Coola Makeup Setting Spray has broad spectrum chemical sunscreens (Avobenzone 2.8%, Homosalate 3.5%, and Octisalate 3.9%) and hyaluronic acid to retain moisture. It’s 70% organic, and is also formulated with peony leaf, juniper berry and phoenix leaf stem cells. The one questionable ingredient for me is the algae extract. I’m not sure which type of algae it is, but it’s the third ingredient which means there’s a pretty high amount. The only reason to avoid algae is if you’re allergic or acne-prone. If you’re not either of those, it’s a great anti-aging ingredient. If you’re acne-prone, I recommend the Supergoop Defense Refresh Setting Mist SPF 50. It’s another one of my faves and a better choice for acne-prone peeps! When I use setting sprays with SPF, I have to be careful to hold my hair back. I find when it gets in your hair, it can be sticky and kind of gross. So just be careful. You’ll smell the alcohol when you spray these, but just give it a minute to dissipate and all is well. After that, you get a light, fresh scent. 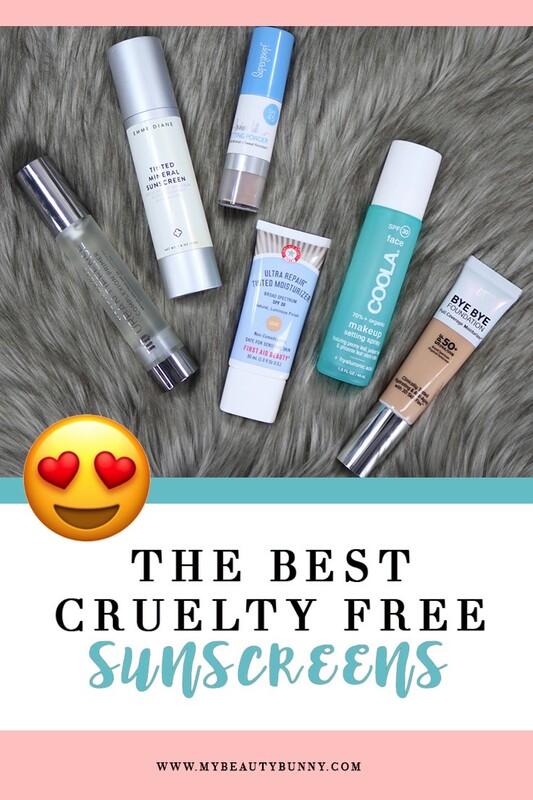 There are lots of great cruelty free sunscreens for your face – the trick is to find the ones that work for you. But even if you have acne-prone skin like me, keep using that sunscreen! It’s the only way to protect yourself against premature wrinkles, sun spots, melasma and skin cancer. 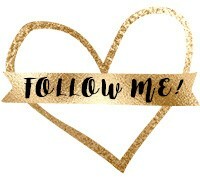 If you have found some great ones, please let me know in the comments below! wow! sounds an amazing product!! Ahh… The Emme Diane sunscreens sound so good and Yay!!!! for them being chemical free! I’m so happy that you featured mineral options in this article! The IT Bye Bye Foundation is a fav and the Coola brand is fantastic. Ok you had me at Emme. CF, vegan and tinted! I want to try this. I want to try that First Aid Beauty sunscreen! I also need to try the IT Cosmetics foundations with sunscreen. Ohhh I love Jan Marini! Have you tried the Kiss My Face Fact Factor SPF 50 under or with makeup? I’m intrigued by it because it’s of course CF, but also pretty cheap. I tried the UD primer in Ulta because I was fascinated that it had SPF but was clear! However, as you said, it did feel slippery so I thought it wouldn’t work for my oily skin. Now, I’m going to have to try it for real! I want to try each one of these! I have such fair, sensitive skin and it is so important to keep it protected from the sun’s harmful rays! Thank you so much for these recommendations!